We are taking our adult inclusive football team to a Euro 2016 theme tournament this Saturday. We will be representing Northern Ireland. We have white shirts with Northern Ireland badge on them. Need green shorts and white socks, or white shorts and green socks, or green shorts and socks to complete the kit. I just need 10 pairs and I will pick them up, wash them and return them. Can anyone help? Did BigDog contact Graham at Levy Green? I did & passed on his details to LoucasX. He called him this morning to arrange everything and left The Park at 3.30pm to go collect the kit from Graham. Can't thank Uncle T & Levy Green enough for helping out our inclusive guys like this. They'll be made up with the full kit and just goes to show what we can all do when we pull together as Spartan clubs for positive causes that benefit us all as community collectives. I won't forget this . . . big thanks to Levy Green, Uncle T & Graham for their help today! 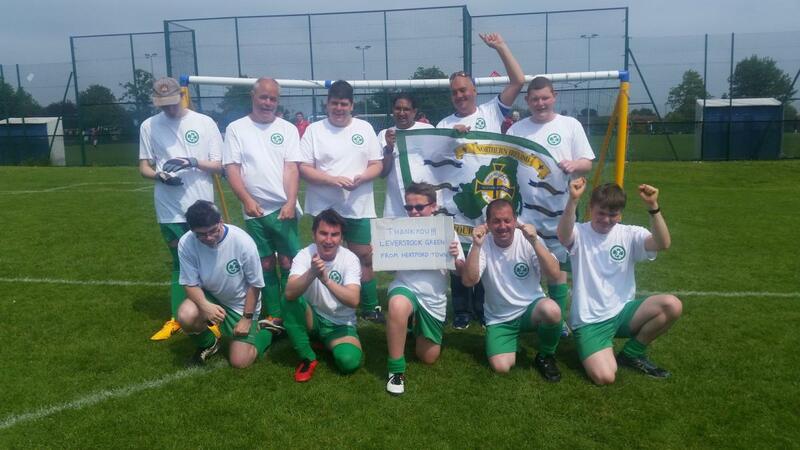 Had a fantastic day representing Northern Ireland in a Euro 2016 inclusive football tournament. The guys love having a kit so we are all thankful to Uncke T, Graham and Bill from Leverstock Green.